Part of Main Street in Niles, Michigan (click on photo to view at larger size). It was raining hard when I pulled in to Niles, Michigan. 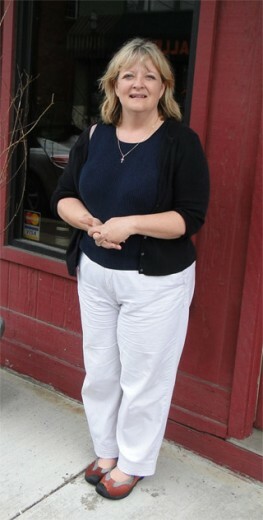 But stepping inside the offices of the Niles Downtown Development Authority/Main Street, Lisa Croteau was in a sunny mood. 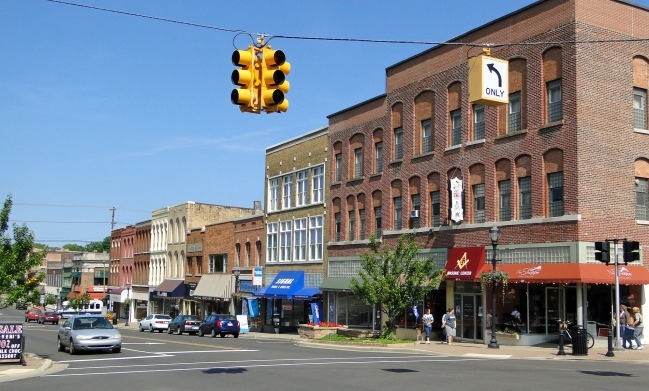 Despite the economic blues facing Michigan, her small city's downtown has been more than holding its own. Croteau is the executive director, program manager, and staff of the organization, all rolled into one upbeat, engaged person -- good qualities to have in a Main Street program director. She told me how Niles' downtown had changed dramatically over the past decade, pulling out "before and after" sets of photos of blocks along Main Street -- including the pair on the right. 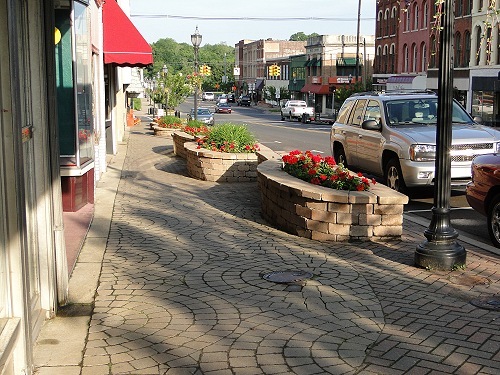 The Niles DDA/Main Street, Croteau told me, has benefitted greatly from its membership in both the Michigan and National Main Street programs. The state program is "a phenomenal resource for us," Croteau noted, providing quarterly training opportunities, including sessions on fundraising techniques and, more recently, social networking. Recently, an expert on retail merchandising came to Niles and spoke with a number of business owners, offering very specific suggestions. This year eight of Lisa's board members attended the National Main Street conference, a "great networking and learning opportunity." But let me back up a bit. Niles itself is a small city (population 12,000), tucked into the southwest corner of Michigan, just ten miles due north of South Bend, Indiana (more on this later). 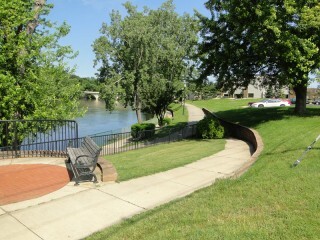 The downtown is compact, running from the St. Joseph River, up a low hill. Niles' Main Street fared very well in the 1950s and '60s, but then started to slump as retailers pulled out for nearby strip malls. The City tried urban renewal in the 1970s, tearing out one large corner of downtown. By 2000, downtown vacancies were over 25 percent. The Main Street organization has been at the heart of the turnaround. As Lisa describes it, the change resulted from lots of one-on-one conversations, trying to convince residents that downtown was worth saving: "we went to people who had given up on downtown, and we re-engaged them, and we got the community to realize that local businesses will be there only if you shop there, if you want them to stay, you've got to support them." 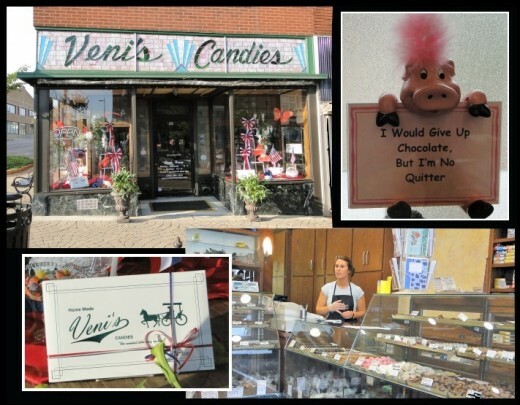 One of the downtown business I visited with Croteau was Veni's Candies -- like many of the downtown retailers, locally owned. Besides making individual connections, the Main Street group focused on creating enjoyable events, including a weekly French Market, and the annual "Hunter Ice Festival," featuring home made ice cream in the middle of January. 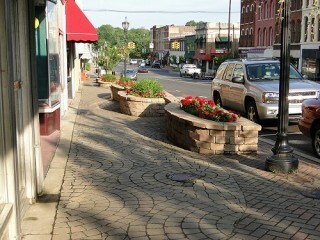 Sidewalk landscaping in downtown Niles. Resources were also funneled into facade and sidewalk landscaping improvements, and the look of downtown started to improve noticeably. The City's design guidelines stress the importance of facades: "The front facades of buildings are one of the most important physical components of downtown -- economically, functionally and aesthetically." 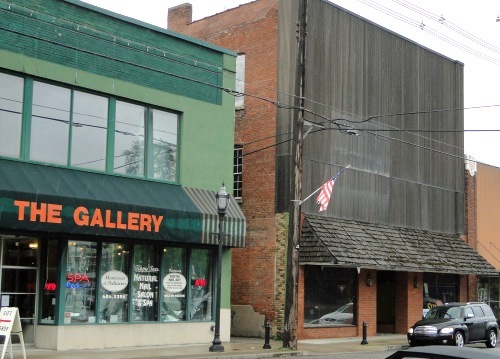 Ironically, one of the "blights" on downtown was the 1960s-era installation of "Shadowform," a Kawneer aluminum facing put on many downtown storefronts (see the photo near the top of the page, and the photo below -- one of the few remaining Shadowform facades). The building on the right is clad in "Shadowform," a Kawneer aluminum facing put on many downtown storefronts. It's now starting to come down. I say ironic, because Kawneer (before moving to Georgia) was a Niles-based company. Indeed, in an even stranger twist, the Kawneer Foundation has helped fund the removal of some of its own facades. 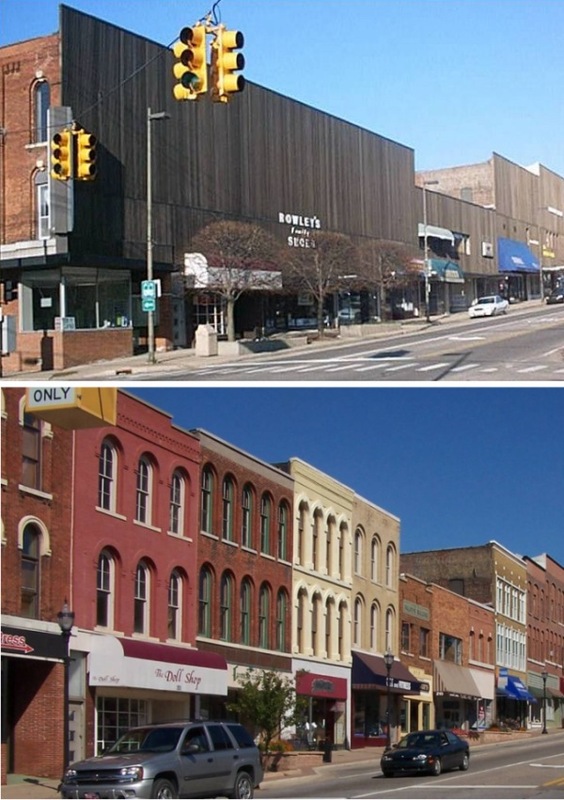 One result, the downtown has been designated a National Historic District. Altogether, about 30 downtown facades have been restored, many assisted by small grants (in the $5,000 range). On Friday I met again with Croteau. We were joined by Juan Ganum, the city's community development director for the past 11 years. Our discussion covered a broad range of challenges and opportunities facing Niles. 1. The need for a more pedestrian-oriented street design. 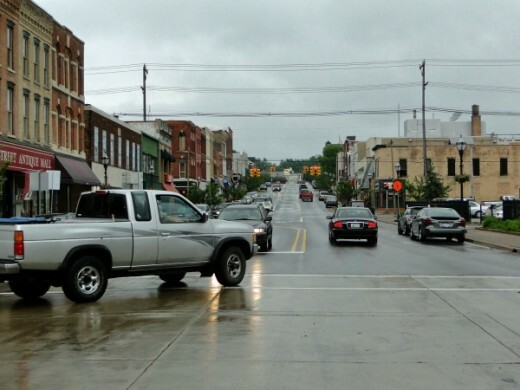 Right now, the Michigan Department of Transportation controls Main Street. Given the state's primary orientation towards keeping the state highway/Main Street flowing smoothly, features like mid-block crossings or angled parking have not been possible. The hope is that the State will yield control over Main Street to the City in the near future, enabling the City to plan for a stronger pedestrian orientation. 2. The lack of an attractive gateway into downtown. In fact, much of the nine mile stretch of the main artery, Route 933, between South Bend and Niles is chock full of strip development. Within the downtown district itself, part of the "renewal" provided in the late 1970s -- in the form of River Front Square, a parking dominated shopping plaza on the southwest corner of downtown -- is now viewed as part of the problem. As the rest of downtown has regained its historic character, River Front Square (above) stands out as increasingly out of character. Click on image to view at larger size. 3. A major vacant space close to downtown. The Simplicity Pattern Company facility, which closed two years ago, now stands vacant. The empty Simplicity Pattern Company building. Niles Community Development Director Juan Ganum in inset. The City, Ganum noted, hopes to find a new use for this 750,000 square foot space, possibly for movie production. In fact, Michigan offers a package of incentives for movie production, but there are also lots of large, empty buildings across the state. Photo of Ganum inset in shot of the Simplicity building. 4. Theater restoration in the works. Niles' old downtown movie theater is being renovated. When back in operation, it will contribute to more night-time activity downtown. Croteau notes that the long-range plans call for a fly screen that would allow the stage to be used for theatrical presentations. 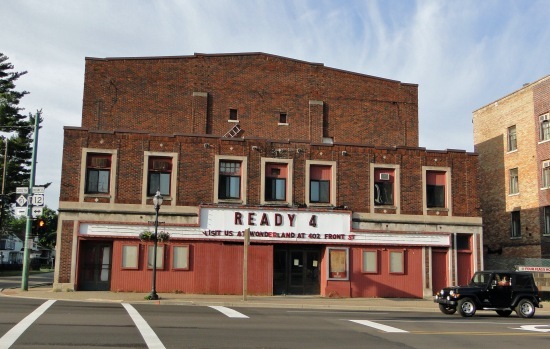 Niles' vacant downtown movie theater is slated for restoration. 5. The lack of any public transit connection between Niles and nearby South Bend. This is something, Ganum said, the City needs to work on. One problem has been an absence of much coordination across state lines. 6. Heritage tourism has tremendous potential. There's excitement about a recent major find by archaeologists from Western Michigan University: the remains of Fort St. Joseph, built by the French in 1690. As both Croteau and Ganum noted, this could have a huge impact on the city, especially given its location just half a mile from downtown (the specific site location has not been publicized). 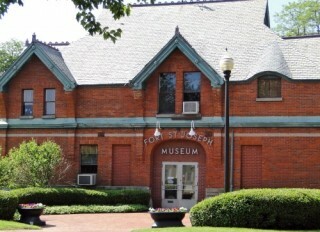 Fort St. Joseph Museum in downtown Niles. Even now, tourism from French-Canadians interested in history has been growing. There's already a terrific resource, the City-owned Fort St. Joseph Museum. As Director Carol Bainbridge told me, the Museum will house the finds from the archaeological dig, strengthening the story it already tells about the sequence of French, British, Spanish (for just 24 hours!) and then American control over the Fort. 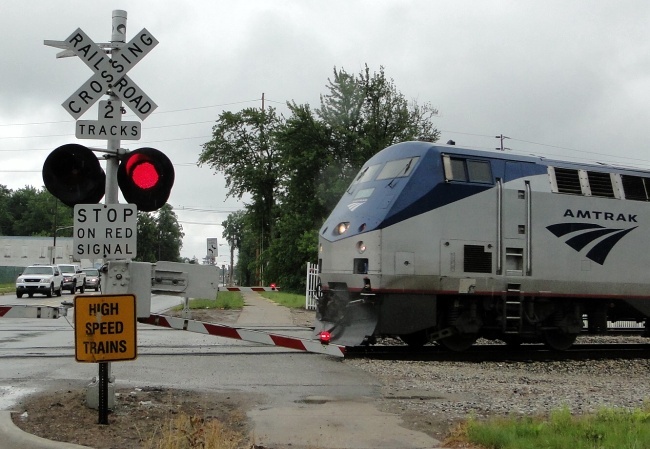 Niles is counting on improved Amtrak service to support its downtown revitalization efforts. 7. High-speed rail is coming. Niles is located along Amtrak's Chicago-Detroit line, which has been designated for development as a high-speed rail corridor. To Croteau this has the potential of bringing Niles within commuting distance of Chicago, which would provide a further boost to the city. photo: Amtrak arriving from Chicago at Niles. Pathways and parks line the waterfront in downtown Niles. 8. The riverfront is key. Located on the west side of downtown, the riverfront has long been perhaps the single most important asset for downtown. Not only is it the location of summertime concerts, but it's the site of a well-used park. There's also a bicycle path along the river, which will soon be extended both north and south, making use of the former right-of-way of the interurban line that once connected South Bend and Benton Harbor, Michigan. This extension, Ganum noted, was the number one priority expressed in a citizen survey. 9. Diversity. Finally, one of the most important strengths of Niles, as Ganum explained, lies in the fact that "we're a diverse community racially and economically." This is also now reflected on the Planning Commission, though, Juan acknowledged, this has taken some recruitment effort. That's a long list of challenges and opportunities for a small city. But underlying much of the progress at the heart of the city -- its downtown district -- has been the work of the Main Street organization, its 400 volunteers, its many supporters, and local businesses. The bottom line so far is this: there are now 183 businesses in the downtown district, a gain of 46 over the past five years; and the number of jobs downtown has also grown, from 415 to 548. Not bad for any city of 12,000 these days, let alone one in hard-pressed Michigan.